Provide comfort for the family of Nancy Collins with a meaningful gesture of sympathy. 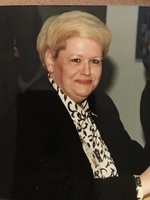 Nancy Ann Collins, 78, a lifelong area resident, died on April 7, 2019 at Vassar Brothers Medical Center surrounded by family and her dear friend Pastor Verdu. Born in Poughkeepsie on July 26, 1940, she was the daughter of the late Dennis and Harriet (Ganung) Collins. Nancy had worked as a Secretary for IBM in Poughkeepsie for many years. She had attended the Arlington Reformed Church, Church of the Nazarene, and Bethel Baptist Church. She enjoyed bowling, jigsaw puzzles, Elvis Presley music and especially her cats. Nancy is survived by her sister-in-law, Holly Collins; her nieces, Amy Griffin and husband Bill, Beth Collins and Lisa Collins; her great nieces and nephews, Kaitlyn Griffin, Kimmie and Germaine Babbitt, Brandon and Allyssa Santiago, James Santiago, and Mari Bernabel; and her great, great niece and nephew, Christina and Logan. She was predeceased by her brother, James E. Collins; and her great, great niece, Kirah. Calling hours will be on Saturday from 1-3pm at the McHoul Funeral Home, Inc., 895 Route 82, Hopewell Junction with a funeral service following at 3pm. Private interment will be in the family plot at Poughkeepsie Rural Cemetery. Memorial donations may be made to Hudson Valley Hospice, 374 Violet Avenue, Poughkeepsie, NY 12601. The family would like to thank VBMC staff and Hospice for their care and support during this difficult time. Please visit Nancy’s Book of Memories at www.mchoulfuneralhome.com. Donations are being accepted for: HOSPICE FOUNDATION INC. Consider providing a gift of comfort for the family of Nancy Collins by sending flowers. "Our tears of sorrow create a puddle of sweet memories for which the heart cannot forget." I have been blessed by your presence & your memory shall remain. Until we meet again !